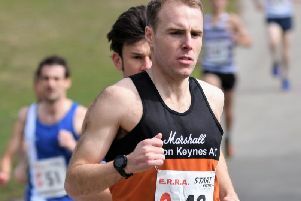 Both the male and female teams from MMKAC comfortably qualified for the Eastern Masters League Final at Bedford. The ladies defended the trophy they won last year but by just a single point from the Stevenage based Fairlands Valley Spartans. It was literally down to the wire, as they say. With the two relays remaining MMKAC were 3-points in arrears. They won the F35 age group relay with Fairlands 4th and making the scores equal. The final relay race for the F50 ladies saw MMKAC finish second but well ahead of their rivals who placed third and leaving MMKAC victory by the single point, 226 to 225. Team manager Lesley Byrne had a team of eleven athletes with four in the F35 age group, five in the F50’s and two for the F60’s. Corinne Nurse won three events for the youngest age group, leading from the front clocking 76.1 in the 400m hurdles and 2.38.8 in the 800m plus clearing 1.30m for a high jump victory. Chrispina Odunewu won the 100m(15.0) and shot(8.43m) whilst Emma Beales easily won the discus throwing 42.63m. Stephanie Johnson triple jumped 8.67m and ran the 200m in 31.8 for third places. Jan Hardcastle worked tirelessly for the F50’s competing in six events including second positions in the triple jump(7.95m), high jump(1.20m) and 800m(3.21.9). Their final victory came from Jeanette Lawrence winning the F50 hammer with a best throw of 21.99m. Diane Baldwin contested the 400m, 3000m and 2km walk with Di Farmer competing in both endurances races, 1500m and 3000m. Lesley Byrne took second places in the shot(8.79m) and discus(18.05m) plus competing in the long jump and pole vault. Ursula Ghaleb and Fi Han Bromilow both competed in four events scoring very valuable points in the F60 events. Ursula placed second in the 2km walk, 800m and long jump with Fi- Han contesting both the 100m and 200m as well as the javelin and discus. Individually the M60’s scored good points but only had a smaller number of events to contest. Ivars Licietis won both 100m and 200m from the six he contested, John Skelton easily won the 3000m(10.26.8) whilst second places from Alasdair Gibson(800m) and Bunt Scott(hammer and javelin).